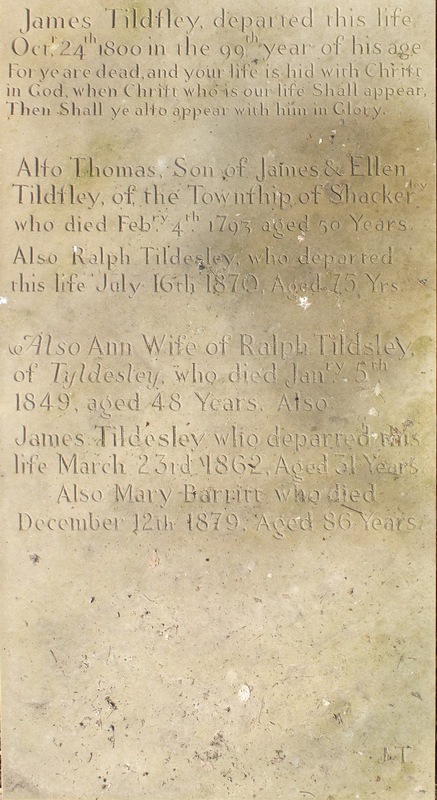 The gravestone of James Tyldesley 1702-1800—this being a recent replica to replace that which had been damaged beyond repair. Octr 24th,1800 in the 99th year of his age. who died Febry 4th, 1795 aged 50 Years. this life July 16th 1870, Aged 75 Yrs. of Tyldesley, who died Janry. 5th. life March 23rd 1862, Aged 31 Years. December 12th 1879, Aged 86 Years.